After attending Thoroughly Modern Millie performed by Studio East at the Kirkland Performing Arts Center, I am reminded that one of the things that I love most about theater is when a performance can not only entertain you but also inspire you and make you reflect upon it and life. The danger of being a critic or reviewing works of art, is that over time we can become cynical or hyper-critical. We lose the spirit and heart of the show and begin to see only the technical implementation. This would be akin to evaluating poetry solely on rhyme and form over the author’s ability to inspire us to see and feel their emotion. I read some reviews and I wonder if the reviewer was driven to find something to criticize, just so that they could feel like they were objective and doing their job. The problem is that all art is subjective, it is filtered through the observer. Therefore, our impressions speak more about us at times, than the actual subject of our review. Studio East Training for the Performing Arts was founded in 1992 with the vision of creating a place where children and teens can learn about the theatrical arts. Their mission is simply, “Studio East creates opportunities for young people to discover and explore the performing arts.” They believe that through that pursuit, children will learn the discipline, dedication and teamwork to be successful not only on the stage, but off the stage. They are correct. The beauty is that in learning this for themselves, they expose audiences to this idea as well. We catch glimpses of it and although we may not always be able to consciously recognize or articulate it, we are moved and for a time we are changed by it. This was my first time attending a performance by Studio East, so I took my seat without much expectation. I must say that I was delightfully surprised. Tatum Ludlam (Millie) and Sonja Usher (Mrs. Meers). 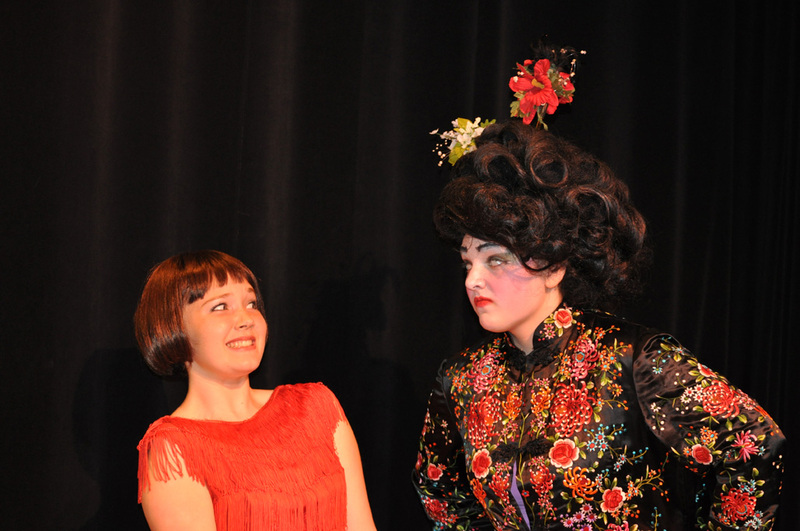 Thoroughly Modern Millie is a musical set in 1922 in New York City. It tells the story of newly arrived young Millie Dillmount, played by the enormously gifted Tatum Ludlam. Ludlam’s inspired vocals, natural charisma and exceptional stage presence energizes the show throughout. Millie has come to New York City lured by its glitz, glamour and modern sensibilities; where women are entering the workforce and the traditional notions of courtship and social behavior are changing. Millie may be young and a bit naive, but she certainly has moxie, infectious charm and big dreams. She is promptly mugged, forced to stay at a rooming house for aspiring actresses and run by the shady Mrs. Meers, played by Sonja Usher. Usher shines with her delightfully wicked portrayal of the former actress turned criminal, Mrs Meers, who uses the rooming house as a front for her new profession of white slaver. Millie befriends another aspiring actress Miss Dorothy Brown, played by the remarkable Jacqueline Tardanico, who mesmerizes the audience with her stirring vocals. The cast is rounded out by Millie’s two love interests, Jimmy Smith (Christian Pflager), Boss Mr. Trevor Graydon (Christian Obert) and an assortment of madcap eclectic characters who each delights in their own way. The performance had many memorable moments created by talented strong individual and group performances. Ludlam’s performance as Millie was remarkable. Her natural geniality and youthful exuberance captured the hearts of the audience immediately. While her vocal performance was spot on throughout, her strong gritty rendition of “Gimme Gimme” stood out. Ludlam’s duets with Tardanico (“How the Other Half Lives“) was transcendent; Pflager (“I Turned the Corner“) was heartfelt and moving and with Obert (“The Speed Test“) just enchanted audience to no end. Within any play, there are frequently smaller supporting roles, played by performers that for whatever reason seem to shine larger than the role itself. Heather Loshchen’s portrayal of Miss Flannery the shift manager was zany, hysterical and very memorable. Christian Obert’s enthused portrayal of Mr. Trevor Graydon shined during “The Speed Test” and his love at first sight duet with Tardanico”Ah! Sweet Mystery o Life / I’m Falling in Love with Someone“. The performance satisfies because of the high caliber production, including direction (Lani Brockman), choreography (Karen Omahen), set design (Marty Eagleson), costuming (Rachel Wilke & K.D. Schill) and live orchestra (conducted by Susan Bardsley), all of which is a testimony to the commitment and professionalism of Studio East. On a sidenote, as an alumni of Roosevelt High School and former stage crew member, I was proud to see a special callout to Ruben Van Kempen and Roosevelt High School for set pieces. I second the comments of DR above- what a show! I can’t imagine a better way to spend a weekend afternoon. I especially agree with DR’s recognition of the actress who played Muzzy- she was a perfect fit for the role, and her mature alto was the perfect foil for Millie’s high notes. Thanks for such a treat, Studio East! What a wonderful show that Studio East put together, it was quite a treat for the senses. The casting could not have been better, the musical performance and the choreography was phenomenal. I agree with all the accolades of the reviewer, but I couldn’t help notice that there was no mention of Muzzy… What a wonderful performance by this young lady!! This alto has such a sultry and seductive quality to her voice, Muzzy truly came alive before my eyes and ears… Bravo Studio East!! !